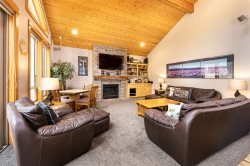 Enjoy a fantastic vacation in this 3,700 square foot, Lodge Style, vacation home located in Sunriver, Oregon. Relax in this beautiful home where the use of logs, natural wood, granite and slate in an open “great room” plan create the perfect vacation environment. Have your own space with seven bedrooms, six and a half baths in a home that provides all the extras of a luxury home with the classy lodge feel of Sunriver. With SIX MASTER SUITES, 6 with KING BEDS, this home is ideal for a large family or a group of couples who all like to have their own room with private bathroom. Take note of the many things in this home that set it apart and make it so convenient for large groups. The kitchen a “cooks-dream” gourmet setup with 2 dishwashers, 2 ovens, and 2 pantries and is equipped with every kitchen appliance/amenity you can imagine. This home has 2 separate living areas, a custom built dining table with plenty of comfortable seating, and 2 washers/dryers as well. The beautiful décor of this home has a black bear theme and provides a wonderful, cozy atmosphere for the ultimate vacation any time of year. Black Bear Lodge has an extremely convenient and central location between circles 4 & 5, and is close to the mall, SHARC center, and tennis courts. When you want a wonderful, luxury, vacation rental that is first class all the way, this home is for you! All new TV’s throughout the home – living room now features a 60” LED TV with high definition cable. All bedrooms now have 32” LCD TV’s with DVD players and the bonus room has a 50” LCD TV as well. The team was wonderful...very friendly, helpful and accommodating. A true pleasure at every interaction. Two dishwashers were great. Large capacity clothes washers great. Gas-fed Grill was awesome. Service was timely and helpful. This is the fifth year we have rented and all properties are great.